Telangana State PSC Trained Graduate Teacher TGT Jobs Recruitment 2017: Telangana State Public Service Commission has given employment notification to recruit B.Ed qualified candidates for Trained Graduate Teachers TGT in various Residential Schools of Telangana State. 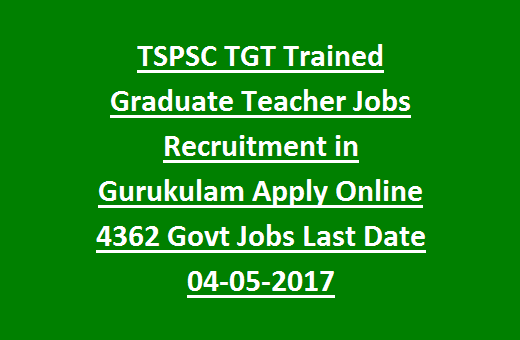 There are total 4362 TGT Teacher jobs in Telangana TSPSC Gurukulam TGT recruitment. Interested/ Qualified candidates can submit their application forms through online mode only using TSPSC Official web portal @ www.tspsc.gov.in from 18- April- 2017 to 04-May-2017. Selection of candidates for Telangana State TSPSC Gurukulam TGT Jobs will be based on Prelims Examination and Main examination. For more details regarding Qualification details, Prelims & Mains exam pattern, TGT Exam syllabus, Number of posts, pay scale of Telangana TSPSC Gurukulam Trained Graduate Teachers recruitment 2017 are given below. Click here to see the Notification of Telangana TSPSC TGT Teacher Govt Jobs Recruitment in Gurukulam. TSPSC online application forms starting date: 18- 04- 2017. TSPSC online application submission closing date: 04- 05- 2017. Main Examination Date: June 2017. TSPSC Admit card available from 7 days before the Exam Date. There are total 4362 TGT posts available in Telangana State Gurukulam. Post Name: Trained Graduate Teacher (TGT)- 4362 posts. School wise vacancies of TGT posts are given below. Candidate must have completed Degree (BA/B.Sc) in relevant subject with at least 60% of marks (SC/ST candidates 55%) and B.Ed or its equivalent degree from UGC recognized Institution or University with at least 50% marks. Candidates must have passed TET Exam conducted by State Govt. Age limit for general candidates is 18 years to 44 years. Age relaxation for SC/ST/OBC candidates is 5 years, for PWD candidates 10 years and for NCC instructors 3 years. Selection for this TSPSC Gurukulam TGT Teachers recruitment will be held in three stages. Preliminary Exam consists of 150 objective type questions for 150 marks, and the duration of exam is 150 minutes. Prelims Exam cover the topics are given below. Main examination will be conducted for 300 marks & consist of 2 papers. Paper 1: Cover the topics of Pedagogy of Concerned- 150 Questions -150 Marks -150 Minutes. -Weightage will be given for written examination is 80%. -20% will be given for TET Part II Exam. Pay Scale for this TSPSC TGT Teacher Jobs recruitment in Gurukulam is Rs. 28,940- Rs. 79,910/-. Online Application Processing fee for all candidates is Rs.200/-. Exam fee for general candidates is Rs.120/-, for other Candidates is nil. Only Online applications are accepted for Telangana State TSPSC Gurukulam TGT recruitment. Interested candidates have to submit their online application forms through TSPSC website @ www.tspsc.gov.in on or before the closing date i.e. 04-May-2017. Submit all required documents/ certificates along with application. Please share this Telangana States PSC Trained Graduate Teacher (Social Studies/ Maths/ Physical Science/ Bio Science/ Telugu/Hindi/English) Recruitment 2017 via Face Book or G+.